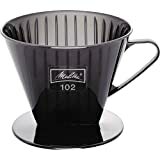 Have you ever wondered how the use of coffee filters came about – here is an interesting story – A German entrepreneur Amalie Auguste Melitta Bentz (31 January 1873 – 29 June 1950) invented the coffee filter on 1908. At the time to make a coffee they used percolators but as we know if left are prone to over brewing, espresso-type machines tended to leave grounds in the drink, and linen bag filters were tiresome to clean. After experimenting with many different materials it’s said she ended up using blotting paper from her son Willi's school exercise book and a brass pot perforated using a nail. The result was grounds-free, less bitter coffee; success so she decided to set up a business. The Imperial Patent Office granted her a patent on 20 June 1908, and the company was entered into the commercial register, and during the 1909 Leipzig fair they sold 1,200 coffee filters. In 1910, the company won a gold medal at the International Health Exhibition and a silver medal at the Saxon Innkeepers' Association. By 1932 she transferred the majority stake of the company to her two sons Horst and Willi, but she still kept a hand in the business. Although during the Second World War production stopped by 1948 business resumed and at the time of Amalie death in 1950, the company was worth some 4.7 million Deutsch marks. Today her grandchildren Thomas and Stephen Bentz still control the Melitta Group headquartered in Minden in the east of North Rhine-Westphalia.